The OEIS is fantastic of course. Lots of contributions (from professionals and amateurs alike), many interesting conjectures, and thus nice opportunies to learn more. Here’s one conjecture though which unfortunately doesn’t work out (feel free to edit the corresponding entry A113910 accordingly). I’ll try to reconstruct here how I think the conjecture was made, and how it breaks down. Lucas numbers are given by the second-order linear reccurence: , and . There’s an explicit formula for the n-th term involving the golden ratio, . An interesting property is that whenever is a prime, one can prove that (see the first few pages of Sun’s review on congruences of Lucas numbers). But this happens for some composite integers too, which have hence been named Lucas pseudoprimes. Ok, so for those integers (primes and Lucas pseudoprimes) we have defined some such that . is the number of points of period n in the golden mean shift. The number of orbits of length n in the golden mean shift is given by the n-th term of the sequence A006206. Indeed, recall that the shift associated to the golden ratio is , where is the space of sequences made of 0’s and 1’s such that no consecutive 1’s appear. This is equivalent to a dynamics modulo 1, namely , if we code by 0 the interval and by 1 the interval . (See the Scholarpedia article by Marcus and Williams for references). Moreover, on the page about A006206 one finds the remark that , where I’ve noted the terms of A006206. So, implicitely, this means that whenever is prime we have . for , if is an integer then it is a prime, and those primes are exactly the lesser of a twin pairs (i.e. a characterization of twins). The conjecture is made by remarking that if and are twin primes, well they are both primes so satisfy , and then using the Lucas reccurence relation one obtains that is an integer, and the conjecture asks whether the converse holds. But there’s the problem. Just forgetting what is, it’s clear that when defined, so the conjecture asserts that Lucas pseudoprimes (for which is also an integer) are never at a distance equal to 2 of a prime (i.e are never creating a pair n, n+2 which would pass the integrality test). Unfortunately 5777 is a Lucas pseudoprime, and 5779 is a prime. One great thing I’ve been made aware of while looking at that stuff are the results of Lagarias which in particular say that the set of primes which divide some Lucas number has density 2/3 , and that more work by various authors has been done since. The event took place today, and apparently Anand managed to win 39 out the 40 games. The last game ended in a draw, and it wasn’t an adult mathematician who managed the feat, but a 14 years old boy, Srikar Varadaraj (whom google reveals has already won junior tournaments, both in the UK and in the US), well done to him. It’s hard to conclude anything from this though, I guess, except the obvious idea that not just analytical abilities are required to be successful at chess, but also lots of training (and vice-versa, as Anand’s interview previous to the event makes clear). 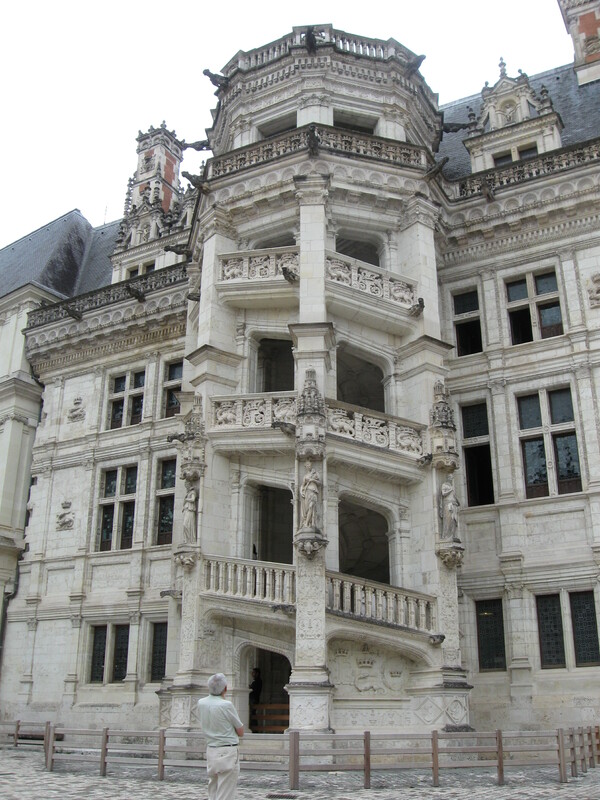 The spiral staircase, Blois castle. Some guesswork: Ngô Bao Châu, Cédric Villani, Artur Avila, Mark Kisin. All have obtained important junior prizes and big permanent positions recently, published several papers in JAMS & Ann. Math. since 2006, and finally they are into their last cycle of eligibility (except Avila). Plus it’s a good mix of subjects. Then, Nevanlinna: Irit Dinur ; Gauss: Yves Meyer ; Chern: Louis Nirenberg. Again, just an educated guess, at least the full participant list so far says they will be there, and they look like good bets (if I understood the prize descriptions correctly). According to the latest schedule, the opening ceremony (which will be streamed live) is set for 9:30 to 12:30am local time, that’s UTC/GMT +5:30. So something like thursday 19 august at 10:30am in Hyderabad will translate into 7:00am Paris time, 6:00am London time, 1:00am East Coast time and actually wednesday 18 august 10:00pm West Coast time. Thus Europe and the Americas will definitely be awake when it’s announced, convenient. But before that, the Perseids! I’ve just stumbled upon SpaceRip which truly is a fantastic youtube channel. Lots of very high quality educational movies there, with great CGI and excellent narration. Actual scientific references are mentionned on wikipedia. Apparently there’s an event planned later this month at ICM where Chess World Champion Viswanathan Anand will simultaneously take on a bunch of mathematicians (among which some big names like Alexei Borodin and Kannan Soundararajan). It should be quite interesting! Both math and chess at high level require the same two main ingredients: analytical thinking, and regular practice. Yet these two activities seem very far apart from each other (at least to me, a really poor chess player): chessplayers memorize absolutely tons of scenarios to always try and make the optimal move, whereas mathematicians rely on imagination fairly often without always going for the slickest proof or trick (for instance the great tricki project, as an analogue of a chessplayer’s dictionnary of moves, is very new and as yet underdevelopped).